Aim: The study was designed to compare the efficiency of three different methods used for retreatment using a dental operating microscope (DOM) and a stereomicroscope and to evaluate and compare the two methods for detection of residual obturation material after retreatment. Background: The DOM can play an important role in the successful retreatment by detecting the remaining obturation material. Materials and Methods: Thirty extracted maxillary central incisors were collected and obturated after biomechanical preparation. The samples were divided into three groups depending on the method of retreatment: Group I, H-files; Group II, ProTaper Universal retreatment files; and Group III: H-files + Gates-Glidden drills, with 10 samples in each group. After retreatment, the samples were observed under a DOM for detection of residual obturation material. Later, the teeth were cleared and observed under a stereomicroscope for detecting the remaining filling material. The results were subjected to the Spearman's rank order test and other statistical analysis. Results: The maximum cleanliness of the root canal walls was seen in Group I while Group II showed the least. The difference between the mean scores obtained with a DOM and a stereomicroscope was statistically significant (P = 0.05). Conclusion: None of the techniques could completely remove the obturation material. The root canal cleanliness is best achieved when retreatment is performed under a DOM. Thirty freshly extracted human maxillary central incisors were collected from the Department of Oral and Maxillofacial Surgery, Faculty of Dental Sciences, CSMMU, Lucknow. In all the samples, the clinical crowns were resected before cleaning and shaping of the root canal in order to keep similar length of all the samples which was 16 mm. The access opening was made using #2 round diamond instrument in a high speed hand-piece. The working length was determined using a radiograph which was kept 1 mm short of the radiographic tip. The apical preparation was then enlarged up to # 50 k-file (DENTSPLY Maillefer, Switzerland) size in all samples while irrigating frequently with 5% NaOCl and EDTA and the rest of the canal was prepared using the step-back technique using successively larger number files. After biomechanical preparation, the root canals were dried and obturated with gutta-percha and AH-Plus sealer (DENTSPLY DeTrey, Germany) by the cold lateral condensation method. The samples were then radiographed to confirm the adequacy of obturation. Access cavities in all samples were sealed with composite Synergy D6 (Coltene Whaledent, Switzerland) restorative material. The samples were then stored in normal saline for 1 week. The 30 samples were randomly distributed into three groups (n = 10). Group II: Protaper Universal retreatment files. Group III: Hedstroem files + Gates-Glidden Drills. The samples were retreated using H-files (DENTSPLY Maillefer, Switzerland). Gutta-percha was removed from the root canals using H-files with sizes 25, 30, 35, 40, 45, and 50 in a circumferential quarter-turn push-pull motion. The retreatment was deemed completed when no gutta-percha and sealer material could be seen on the instrument and also when the canal appeared clean when inspected with naked eyes. The samples in these groups were retreated with ProTaper Universal retreatment files (DENTSPLY Maillefer, Switzerland). Without engaging dentin, D 1 was gently pressed into the obturation material. D 1 was used to remove the obturation material from the coronal one-third of the root canal. After using D 1 , D 2 was used to progressively remove material from the middle one-third. The remaining obturation material from the apical one-third of the root canal was removed with D 3 . In between the files were removed frequently for inspecting the flutes. Continued as long as the obturation material was visualized between the cutting blades. The samples were retreated with H-files and Gates-Glidden drills. The filling material was removed using Gates-Glidden drills from the coronal and middle third of the root canal and the apical third was cleaned using H-files. 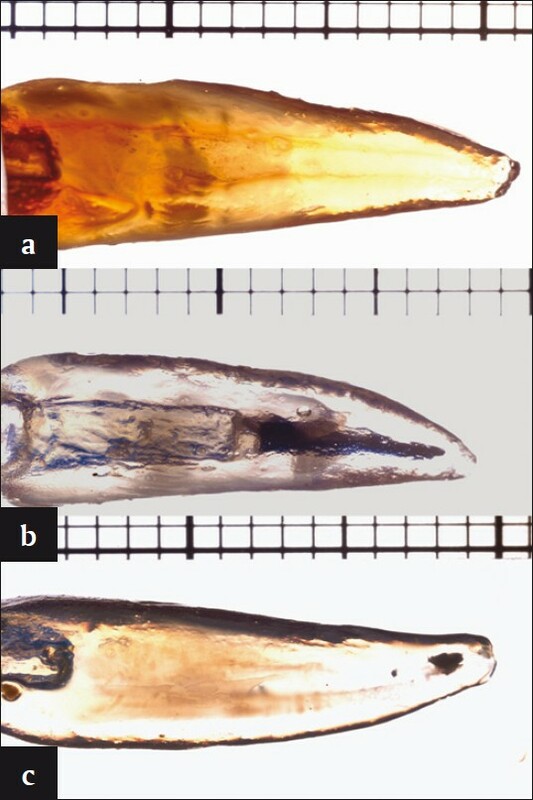 The teeth in all the groups were made transparent by Robertson's method: After observing the samples under a DOM, the specimens were decalcified in 5% nitric acid for 72 h, then washed for 4 h and dehydrated in increasing concentrations of alcohol, i.e. 80% alcohol for 12 h, 90% alcohol for 1 h, and 99% alcohol for 3 h. The samples were then subsequently cleared by storing them in methyl salicylate. After clearing, the samples were observed under a stereomicroscope at 6.5× (SZX7 Olympus America Inc.) and the images were subjected to Image Analysis Software (Image Tool 3.00 UTHSC San Antonio), for detection of residual obturation material [Figure 1]. The samples were scored for residual obturation material, and the criteria adopted for scoring was the same as the one followed when observed under a DOM. Apart from measuring the residual filling material linearly, the area of residual obturation material was also measured in mm 2 . The upper and lower confidence limit for the mean was calculated to show the significant difference between the scores obtained with a DOM and a stereomicroscope. Furthermore, the mean was calculated to show the significant difference among the three groups in scores given by a DOM and a stereomicroscope and the areas measured in mm 2 by a stereomicroscope. The degree of correlation between measurements was determined using Spearman's correlation coefficient. In addition, statistically significant differences were evaluated using the paired t-test. The confidence limits and paired t-tests were used to show statistically significant differences between the scores given by a DOM and a stereomicroscope. Spearman's correlation coefficient was used to determine the correlation between the area of remaining obturation material measured in transparent roots and the scores obtained by the DOM and the stereomicroscope. The level of significance was set at 0.05. 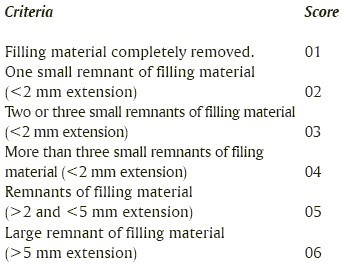 The mean score of residual filling material after observing the samples under a DOM and then under a stereomicroscope is given in [Table 1]. The statistically significant difference was found between the mean scores of Groups I and II for a DOM and a stereomicroscope (P = 0.014 and P = 0.0045, respectively). The difference between the mean scores of Groups II and III for a DOM and a stereomicroscope was also significant (P = 0.016 and P = 0.0022, respectively). The mean area of residual obturation material after observing the three groups under a stereomicroscope was the highest in Group II (3.5820 mm 2 ) and the lowest in Group I (2.9520 mm 2 ) [Table 2]. There was a low and nonsignificant correlation between the scores obtained by the DOM and areas of residual filling material measured in transparent roots [Table 3]. In addition, there was a low and nonsignificant correlation between the scores obtained with the stereomicroscope and areas of residual filling material measured in the transparent root [Table 3]. The difference in the mean scores obtained with the DOM and the stereomicroscope taking all the samples together was statistically significant (P = 0.05). Therefore, the scores given by a stereomicroscope were significantly higher than the scores given by a operating microscope. No method of retreatment could completely clean the root canal walls, but the H-file was found to be more efficient than the other two methods for the root canal retreatment. The DOM detected the residual obturating material left in the canal after completion of retreatment, but stereomicroscopic evaluation of the samples showed that DOM underestimated the amount of residual material left inside the canal though the difference was found to be small. In this study, the roots were cleared to allow the measurement of the area of residual obturation material because remaining gutta-percha or sealer might get lost by splitting the roots longitudinally. , Comparing the scores obtained in each group by examining the samples under a DOM and stereomicroscope, there was statistically significant difference between the scores obtained by the two methods of evaluating the re-treated roots (P = 0.05). Even though the co-relation between the scores given after microscopic examination of the roots and the area measured in the transparent roots was low, the microscope with its increased illumination and magnification seemed to facilitate detection of remaining filling material that may harbor necrotic tissue or bacteria. Therefore, it can be argued that DOM is indispensable in the root canal retreatment especially in teeth with straight roots. It is not possible to remove gutta-percha/sealer from the root canal completely during retreatment. No single instrument is capable of removing gutta-percha completely from the root canals during retreatment. Hand instruments produce better root canal cleanliness. Visualization of the root canal under a DOM during retreatment increases the ability of the operator to remove remaining obturation material. 1. Siqueira JF Jr. Aetiology of root canal treatment failure: Why well-treated teeth can fail. Int Endod J 2001;34:1-10. 2. Allen RK, Newton CW, Brown CE. A statistical analysis of surgical and nonsurgical endodontic retreatment cases. J Endod 1989;15:261-6. 3. Sjogren U, Hagglund B, Sundqvist G, Wing K. Factors affecting the long term results of endodontic treatment. J Endod 1990;16:498-504. 4. Stabholz A, Friedman S. Endodontic retreatment- case selection and technique. Part 2: Treatment planning for retreatment. J Endod 1988;14:607-14. 5. Vinothkumar TS, Deivanayagam K, Ganesh A, Kumar D. Influence of different organic solvents on degree of swelling of poly (dimethyl siloxane)- based sealer. J Conserv Dent 2011;14:156-9. 6. Marfisi K, Mercade M, Plotino G, Duran-Sindreu F, Bueno R, Roig M. Efficacy of three different rotary files to remove gutta-percha and Resilon from root canals. Int Endod J 2010;43:1022-8. 7. Ferreira JJ, Rhodes JS, Ford TR. The efficacy of gutta-percha removal using ProFiles. Int Endod J 2001;34:267-74. 8. Hulsmann M, Stotz S. Efficacy, cleaning ability and safety of different devices for gutta-percha removal in root canal retreatment. Int Endod J 1997;30:227-33. 9. Carr GB, Murgel CA. The use of the operating microscope in endodontics. Dent Clin North Am 2010;54:191-214. 10. Song M, Kim HC, Lee W, Kim E. Analysis of the cause of failure in nonsurgical endodontic treatment by microscopic inspection during endodontic microsurgery. J Endod 2011;37:1516-9. 11. Hulsmann M, Bluhm V. Efficacy, cleaning ability and safety of different rotary NiTi instruments in root canal retreatment. Int Endod J 2004;37:468-76. 12. Gutmann JL, Dumsha TC, Lovdahl PE. Problem-solving challenges in the Revision of Previous Root Canal Procedures. In: Problem Solving in Endodontics: Prevention Identification and Management.4th ed. St. Louis Missouri : Elsevier Inc.; 2006. p. 239-80. 13. Unal GC, Kaya BU, Tac AG, Kececi AD. A comparison of the efficacy of conventional and new retreatment instruments to remove gutta-percha in curved root canals: An ex vivo study. Int Endod J 2009;42:344-50. 14. Betti LV, Bramante CM. Quantec SC rotary instruments versus hand files for gutta-percha removal in root canal retreatment. Int Endod J 2001;34:514-9. 15. Jayasimha Raj U, Mylswamy S. Root canal morphology of maxillary second premolars in an Indian population. J Conserv Dent 2010;13:148- 51. 16. Tagger M, Katz A, Tamse A. Apical seal using the GPII method in straight canals compared with lateral condensation, with or without sealer. Oral Surg Oral Med Oral Pathol 1994;78:225-31. 17. Felton DA, Webb EL, Kanoy BE, Dugoni J. Threaded endodontic dowels: Effect of post design on incidence of root fracture. J Prosthet Dent 1991;65:179-87. 18. Hall MC, Clement DJ, Dove SB, Walker WA 3 rd . A comparison of sealer placement techniques in curved canals. J Endod 1996;22:638-42. 19. Lussi A, Imwinkelried S, Stich H. Obturation of root canals with different sealers using non-instrumentation technology. Int Endod J 1999;32:17- 23. 20. Schirrmeister JF, Meyer KM, Hermanns P, Altenburger MJ, Wrbas KT. Effectiveness of hand and rotary instrumentation for removing of a new synthetic polymer-based root canal obturation material (Epiphany) during retreatment. Int Endod J 2006;39:150-6. 21. de Mello Junior JE, Cunha RS, Bueno CE, Zuolo ML. Retreatment efficacy of gutta-percha removal using a clinical microscope and ultrasonic instruments: Part I-an ex vivo study. Oral Surg Oral Med Oral Pathol Oral Radiol Endod 2009;108:e59-62. 22. Barrieshi-Nusair KM. Gutta-percha retreatment: Effectiveness of nickel-titanium rotary instruments versus stainless steel hand files. J Endod 2002;28:454-6. 23. Zakariasen KL, Brayton SM, Collinson DM. Efficient and effective root canal retreatment without chloroform. J Can Dent Assoc 1990;56:509- 12. 24. Schirrmeister JF, Wrbas KT, Schneider FH, Altenburger MJ, Hellwig E. Effectiveness of hand file and three nickel-titanium rotary instruments for removing gutta-percha in curved root canals during retreatment. Oral Surg Oral Med Oral Pathol Oral Radiol Endod 2006;101:542-7.